How can the chip be replaced? I think the best solution would be to use a PCB with small (SOIC) versions of the three chips in a flat-pack form factor. This PCB would be placed over the holes where the JIO used to be and attached via a pair of interposer-style sockets supporting the shrink/skinny DIP pitch of the JIO chip. That pitch should be .070" or 1.78mm. These sockets would seem to fit the bill : https://www.mill-max.com/assets/pdfs/127.pdf (Use two of the 16-pin sockets to get 32 pins). With the added height of the interposers, you should be able to fit a board on top which may be slightly wider and longer than the JIO chip and give you more room to work. The 32-pin chip has several redundant or not-connected pins : http://nesdev.com/nes_pio_pinout.txt It looks like the holes where pins 2, 12, 15, 31 & 32 went can be repurposed for inverter input and output. As you can see, the Famicom used all twelve inverters provided by the 74HC386s for various signals. The AV Famicom only ended up using nine inverters. It has been established that M2 is sufficiently strong that it does not require buffering. My NES controllers with their long cables work just fine in my AV Famicom. Each 74HC368 is a hex buffer/inverter (3-state) with six inverters. We can use the three extra inverters provided by the 74HC386 to handle microphone and zapper inputs. The AV Famicom's Controller Ports do not connect the D3 and D4 pins. I restored Controller Port 2 Zapper functionality by connecting those pins to the corresponding $4017 D3 and D4 on the Famicom Expansion Port. However, we can instead use one of those pins for the microphone input and connect a Controller Port 2 Zapper to the Expansion Port via a physical adapter. One inverter will be used to handle the microphone input at $4016 D2. Two inverters will be used to implement $4016 D3 and D4 on Controller Port 1. This is where things may get a little aesthetically unpleasing. We only have five unused pins, but we need six to implement all three inverters. While some wiring will need to be added, I would like to have done so entirely on the underside of the board to keep things looking as neat as possible. However, one wire will need to go topside from the board across to some of the bare metal of the exposed pin for D4 on Controller Port 1. It may be possible to design the board to extend to the Controller Port pin and require only a little bit of solder rather than a wire stretched like a clothesline. It has been discovered by Ace that the reason why the Famicom's internal audio goes to the cartridge so quietly is because of the amp constructed with the JIO inverter. He got Famicom audio levels to match his old, pre-GPM Famicoms by recreating the amp found in those Famicoms and bypassing the JIO chip. I thought the quieter audio levels were due to the higher CPU revisions (G & H) found in the later consoles, but they were not. We do not know what kind of resistance is being applied inside the JIO chip. GPM Famicoms were first introduced in 1988, so games developed on the earlier models' boards would likely expect the mixing levels of those boards. That includes most FDS games and probably the majority of the cartridge games. The new board revisions probably took a while to percolate and it was mostly the oldest Japanese licensees that dabbled in expansion audio. One issue with board design would be to make the board in such a way that it would not conflict with the NESRGB board, which is a very popular mod for AV Famicoms. The NESRGB is a large board that sits on top of the PPU and covers more surface area than just the PPU. The Hi-Def NES's PPU interposer is much smaller. The board's pin holes may have to be shifted toward the front of the console somewhat to give enough clearance to the NESRGB. Another issue is that the mode contemplates wires running from the data bus to the JIO pins, and the nearest convenient place to obtain some of these signals is across the PPU. This could add noise to the AV Famicom's renowned jailbar-free video signal. 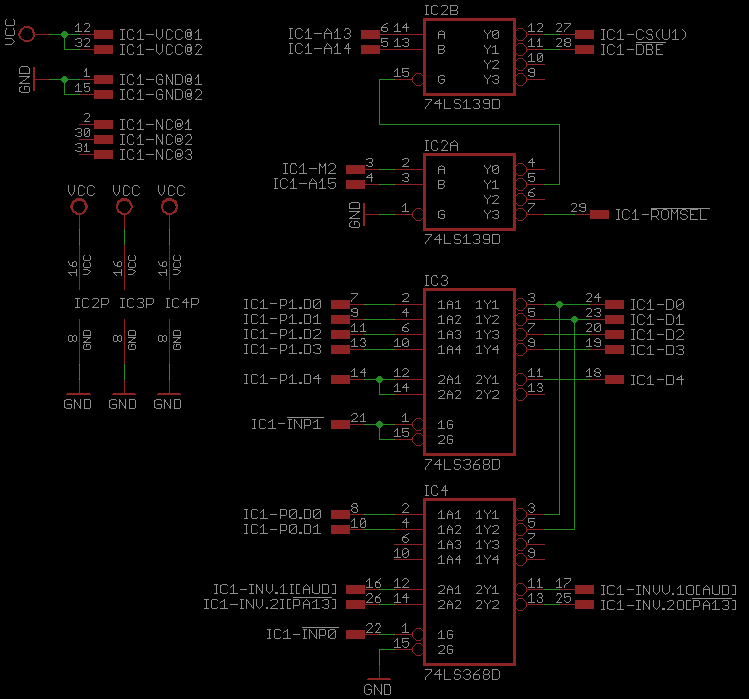 I don't suppose you have one of these ICs (or both) and would be willing to produce a pinout? 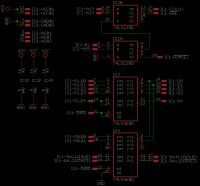 IMO, this would be an easy thing to make using some pin header or a castellated PCB and a handful of 74xx parts. I assume the BU3266 is the same, but I can't be sure and my AV Famicom (HVCN-CPU-02) has the BU3270. Last edited by Great Hierophant on Wed Dec 06, 2017 11:12 am, edited 4 times in total. What's the distance between two adjacent rows of pins? 0.4" ? There was a mistake or two in the original post. First, there is no need to run wires to the CPU or PPU. D0-D4 is already available at the socket to be made by removing the BU chip. Only three additional pins maximum are needed, and those are for output. Famicoms use H, HC for the '368 and typically use LS (but occasionally HC) for '139. A pure restoration should use the '368 as an amp, even if it would be less than ideal from a noise perspective. I like your design, it can be extended easily in 3 of 4 directions to add passives like decoupling caps and the negative feedback resistor. I would not like to add any unnecessary space on the right side of the pins, that could conflict with the NESRGB mod.